Laurence John Fishburne III (born July 30, 1961) is an American actor, playwright, director and producer, best known for playing Morpheus in The Matrix trilogy, Jason "Furious" Styles in the 1991 drama film Boyz n the Hood and Tyrone "Mr. Clean" Miller in the 1979 war film Apocalypse Now. Fishburne became the first African American to portray Othello in a motion picture by a major studio when he appeared in Oliver Parker's 1995 film adaptation of the Shakespeare play. For his portrayal of Ike Turner in What's Love Got to Do With It, he was nominated for an Academy Award for Best Actor. He won a Tony Award for Best Featured Actor in a Play for his performance in Two Trains Running (1992), and an Emmy Award for Outstanding Guest Actor in a Drama Series for his performance in TriBeCa (1993). Fishburne starred in several cult classics, including Deep Cover and King of New York. From 2008 to 2011, he starred as Dr. Raymond Langston on the CBS crime drama CSI: Crime Scene Investigation and from 2013 to 2015 starred as Special Agent Jack Crawford on the NBC thriller series Hannibal. In 2013, he portrayed Perry White in the Zack Snyder-directed Superman reboot Man of Steel and in 2016 reprised his role in Batman v Superman: Dawn of Justice. Fishburne was born in Augusta, Georgia, the son of Hattie Bell (née Crawford), a junior high school mathematics and science teacher, and Laurence John Fishburne, Jr., a juvenile corrections officer. After his parents divorced during his childhood, his mother moved with him to Brooklyn, New York, where he was raised. Fishburne's father saw him once a month. Fishburne is a graduate of Lincoln Square Academy in New York, which closed in the 1980s. For most of his early career, he was credited as Larry Fishburne. In 1973, Fishburne had his first acting role portraying Joshua Hall on the ABC soap opera One Life to Live. He auditioned for the role of Michael Evans in the television series Good Times, but the role went to Ralph Carter. His most memorable childhood role was in Cornbread, Earl and Me, in which he played a young boy who witnessed the police shooting of a popular high school basketball star. He later earned a supporting role in Apocalypse Now, in which he played Tyrone Miller, a cocky 17-year-old Gunner's Mate 3rd Class from the Bronx, nicknamed Mr. Clean. When production began in March 1976, he was just 14 years old, having lied about his age to get the part. Filming took so long that he actually was 17 years old upon its completion. Fishburne spent much of the 1980s in and out of television and periodically on stage. In the early 1980s, he worked as a bouncer at punk rock clubs. He also had a role in the early 1980s movie Band of the Hand, and he had a minor role in the critically acclaimed Steven Spielberg film The Color Purple. He also had a role in the 1984 movie The Cotton Club. Fishburne had a recurring role as Cowboy Curtis on Paul Reubens' CBS children's television show Pee-wee's Playhouse. He also appeared in the M*A*S*H episode, "The Tooth Shall Set You Free". In Spenser: For Hire, he was a guest star for the second-season episode "Personal Demons". He appeared as a thug in Death Wish 2 (1982). He also appeared alongside Kevin Bacon in Quicksilver. His stage work during the 1980s included Short Eyes (1984), and Loose Ends (1987), both produced at Second Stage Theatre in New York City. Also in 1987 he played a part in the third Nightmare On Elm Street film as a hospital orderly. Fishburne featured in Red Heat (1988) beside Arnold Schwarzenegger and James Belushi. Fishburne also starred as "Dap" in Spike Lee's School Daze (1988). Fishburne's character was a depiction of an African American, culturally inclined college student at a historically black college. In 1990, he played Jimmy Jump in the controversial King of New York, and in 1991, Fishburne starred in Boyz n the Hood. The following year, in 1992, he won a Tony Award for his stage performance in the August Wilson play Two Trains Running and an Emmy Award for his performance in the opening episode, "The Box," of the short-lived anthology series television drama TriBeCa. He also starred in Deep Cover alongside Jeff Goldblum. In 1993, he received his first Oscar nomination for his portrayal of Ike Turner in What's Love Got to Do With It. Fishburne won an Image Award for "Outstanding Supporting Actor in a Motion Picture" for his performance as West Indian Professor Maurice Phipps in the 1995 American drama ensemble film, Higher Learning. He played the title role in Othello, the second African-American actor, after Paul Robeson, to perform the role. In 1997, Fishburne starred in the science fiction horror Event Horizon alongside Sam Neill. Fishburne is perhaps best known for his role as Morpheus, the hacker-mentor of Neo, played by Keanu Reeves, in the 1999 blockbuster science fiction film The Matrix. Fishburne provided the voice of Thrax in Osmosis Jones in 2001. He reprised his role as Morpheus in the Matrix sequels The Matrix Reloaded, and The Matrix Revolutions in 2003. He briefly featured as a stretcher-bearer in one version of the video for The Spooks' song "Things I've Seen" (2000) and appeared with Tom Cruise as Theodore Brassell, IMF superior of Cruise's character in Mission: Impossible III. Fishburne has worked with actress Angela Bassett on four projects. He said that "An electrifying thing happens when the two of us work together. I haven't experienced it with anyone else. A freedom happens when we work together." In 2006, they appeared onstage in a Pasadena Playhouse production of August Wilson's Fences. He played terrorist leader, Ahmat who was revealed to be CIA in the 2006 film Five Fingers. He provided the voice of the narrator in the 2007 Teenage Mutant Ninja Turtles film, TMNT. The same year, he provided the voice of the Silver Surfer in 2007 film Fantastic Four: Rise of the Silver Surfer. On February 24, 2007, Fishburne was honored with the Harvard Foundation's Artist of the Year award at the annual show Cultural Rhythms. He received this honor for his achievements as an actor and entertainer and for his humanitarian pursuits. Fishburne is a UNICEF ambassador. The mayor of Cambridge, Massachusetts, Kenneth Reeves, awarded him the key to the city and declared February 24 "Laurence Fishburne" day in the city. In April 2008, Fishburne returned to the stage in the Broadway production of Thurgood, a new play by George Stevens, Jr. Thurgood opened at the Booth Theatre on April 30, 2008. He won the Drama Desk Award for Outstanding One-Person Show for his performance. On February 24, 2011, HBO screened a filmed version of the play performed at the John F. Kennedy Center for the Performing Arts. On February 16, 2011, the White House hosted a screening of the film as part of its celebrations of Black History Month. On August 18, 2008, it was reported that Laurence Fishburne would join the cast of CSI: Crime Scene Investigation after William Petersen, who played Gil Grissom, left the series. John Malkovich was also considered for the role prior to the announcement. Fishburne joined the show on the ninth episode of the 9th season as a college professor and former pathologist whose area of expertise involves some criminals' predisposition to commit acts of violence. The character was introduced as a consultant on a case ("19 Down"), who winds up joining the CSI team ("One to Go"). In May 2009, Fishburne performed on-stage in the National Memorial Day Concert on the Mall in Washington, D.C.
Fishburne starred in Predators in 2010 and Contagion in 2011. 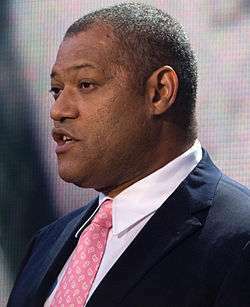 On June 7, 2011, Fishburne announced that he was leaving CSI to return to movies and theatre, opting not to renew his contract and would not appear in Season 12. Fishburne played Perry White in the Zack Snyder-directed Superman reboot Man of Steel (2013). In 2013, Fishburne joined the cast of Hannibal, as Dr. Jack Crawford, head of Behavioral Sciences at the FBI. In 2014, Fishburne reprised his role as Morpheus in a series of Kia K900 commercials. In 2015, Fishburne joined the ABC sitcom Black-ish in the recurring role of Pops; Fishburne is also a producer on the show. In 2016, Fishburne reprised his role as White in the sequel Batman V Superman: Dawn of Justice. Fishburne married actress Hajna O. Moss in 1985, in New York. They have two children together: a son, Langston, born in 1987, and a daughter, Montana Fishburne, born in 1991. Hajna and Laurence divorced in the 1990s. Fishburne met actress Gina Torres and they were engaged in February 2001 and married on September 22, 2002, at The Cloisters museum in New York City. On January 8, 2007, Fishburne's spokesman Alan Nierob announced the couple were expecting their first child together. A daughter, Delilah, was born to the couple in June 2007. Fishburne lives in Hollywood, and also maintains a residence in New York City, in the Castle Village Co-Op in the Hudson Heights section of Washington Heights. He is a big fan of Paulo Coelho and plans to produce a movie based on his novel The Alchemist. ↑ "Laurence Fishburne". Encyclopædia Britannica. Encyclopædia Britannica Online. 2008. Retrieved 2008-04-08. 1 2 3 4 "Laurence Fishburne- Biography". Yahoo! Movies. Retrieved 15 July 2013. ↑ "Laurence Fishbourne: Biography". Yahoo! Movies. Retrieved 2007-01-31. ↑ Paul Chutkow. "Laurence Fishbourne: Flying Fish". Cigar Aficionado. Retrieved 2007-05-24. 1 2 "Laurence Fishburne". BuddyTV. Retrieved August 26, 2014. 1 2 3 4 5 "Laurence Fishburne". metacritic.com. Retrieved 19 September 2014. ↑ "Cornbread, Earl & Me (1975)". New York Times. Retrieved 19 September 2014. ↑ "The Little Lie That Launched Laurence Fishburne's Career". youtube. Retrieved 19 September 2014. ↑ "Documentarian Chris Metzler on Everyday Sunshine: The Story of Fishbone". Weekly Alibi. 8 December 2011. ↑ "The Color Purple (1985)". new york times. Retrieved 19 September 2014. ↑ Brad Slager (August 23, 2012). "Bad Movies We Love, Bike Messenger Edition: Kevin Bacon in Quicksilver". movieline.com. Retrieved 19 September 2014. ↑ "School Daze (1988) Trailer (Laurence Fishburne, Giancarlo Esposito, Tisha Campbell-Martin)". youtube. Retrieved 19 September 2014. ↑ "Diddy to Remake '90s Cult Classic 'King of New York'". essence.com. Retrieved 19 September 2014. ↑ "Best Men: The Top 10 Movie Dads We'd Use To Build the Perfect Father". Time. June 14, 2012. Retrieved 19 September 2014. 1 2 3 "Laurence Fishburne Biography". biography.com. Retrieved 19 September 2014. ↑ "Laurence Fishburne". Television Academy. Retrieved 2 October 2015. ↑ "Laurence Fishburne". .movieactors.com. Retrieved 19 September 2014. ↑ "Deep Cover (1992) trailer". youtube. Retrieved 19 September 2014. ↑ Tucker, Ken (Dec 22, 1995). "Othello (1995)". Entertainment weekly. Retrieved 19 September 2014. ↑ "Othello (1995) FILM REVIEW;Fishburne and Branagh Meet Their Fate in Venice". nytimes.com. Retrieved 19 September 2014. ↑ Ebert, Roger (December 29, 1995). "Othello". rogerebert.com. Retrieved 19 September 2014. ↑ "The Matrix Reloaded (2003) Trailer (Laurence Fishburne, Carrie-Anne Moss, Keanu Reeves)". youtube.com. Retrieved 19 September 2014. ↑ "The Matrix Revolution : An Interview with Laurence Fishburne and Keanu Reeves". blackfilm.com. October 2003. Retrieved 19 September 2014. ↑ Angie Han (July 9, 2014). "Alec Baldwin in Talks for 'Mission: Impossible 5′ [Updated]". slashfilm.com. Retrieved 19 September 2014. ↑ SimzBrazil. "Angie B News". angiebnews.blogspot.com. Retrieved 2 October 2015. ↑ "Angela Bassett and Laurence Fishburne to Reunite for Pasadena Playhouse's Fences". TheaterMania.com. July 7, 2006. Retrieved 20 September 2014. ↑ Terri Roberts (September 2006). "Fences". TheaterMania. Retrieved 2007-02-01. ↑ Heather Newgen (25 January 2007). "TMNT Studio Visit". ComingSoon. Retrieved 2007-02-01. ↑ "Laurence Fishburne voicing the Silver Surfer". totalfilm.com. April 19, 2007. Retrieved 19 September 2014. ↑ "Harvard Foundation names Laurence Fishburne the 2007 Artist of the Year". harvard.edu. February 22, 2007. Retrieved 19 September 2014. ↑ "Harvard Foundation names UNICEF Ambassador Laurence Fishburne 2007 Artist of the Year". UNICEF USA. 20 February 2007. Archived from the original on 2007-09-27. Retrieved 2007-02-25. ↑ Laurence Fishburne: Biography from. Answers.com. Retrieved on 2011-11-21. ↑ Staff writers (24 October 2007). "Laurence Fishburne is 'Thurgood' on Broadway Spring 2008". Broadway World. Retrieved 2008-04-08. ↑ Zurawik, David (February 18, 2011). "HBO's 'Thurgood' is an exceptional look at race and the law". The Baltimore Sun. Retrieved January 2, 2012. ↑ White House (February 24, 2011). "White House Screening of "Thurgood"". US Federal Government. Retrieved January 2, 2012. ↑ Laurence Fishburne & John Malkovich Investigated For 'CSI' Role – Starpulse Entertainment News Blog. Starpulse.com (2008-07-16). Retrieved on 2011-11-21. ↑ PBS Memorial Day Concert. Pbs.org. Retrieved on 2011-11-21. ↑ "Meet Laurence Fishburne as the Unstoppable Noland in New 'Predators' Character Profile". BloodyDisgusting. ↑ "Jude Law Drops some hints about his Contagion Character". DreadCentral. ↑ Vary, Adam B. (August 2, 2011). "Laurence Fishburne cast as Perry White in 'Man of Steel' – EXCLUSIVE". Entertainment Weekly. Retrieved August 2, 2011. Lois Lane and Clark Kent just got their boss: Laurence Fishburne will play Daily Planet editor-in-chief Perry White in Man of Steel, EW has learned exclusively. White has traditionally been a hard-charging, old fashioned newspaperman, who relies on his ace reporters, Clark and Lois, to get the big scoop. Jackie Cooper played White in the Christopher Reeve era Superman films, and Frank Langella took on the role in director Bryan Singer's Superman Returns in 2006. ↑ Estrada, Zac (2014-01-28). "Kia's The Matrix Super Bowl Ad Sells A K900 With Morpheus And Two Keys". Jalopnik. Retrieved 2014-01-29. ↑ Andreeva, Nellie (October 9, 2013). "Anthony Anderson Toplines ABC Comedy Written By Kenya Barris & Produced By Laurence Fishburne Who May Guest Star". Deadline Hollywood. Retrieved January 7, 2016. ↑ "'Batman V Superman: Dawn Of Justice' Pics". Access Hollywood. Retrieved January 6, 2016. ↑ Barron, James (September 24, 2002). Boldface Names: An Amicable Merger. The New York Times, Section B; Column 3; Metropolitan Desk; Pg. 2. ↑ "LA Daily News – Laurence Fishburne and wife Gina Torres are expecting their first child, his publicist says". Dailynews.com. Retrieved 2010-04-09. ↑ Edie Falco, on My Kids Look Like Fabio and Chucky!. "Update: Laurence Fishburne and Gina Torres welcome first child; spotted out in Hollywood : Celebrity Baby Blog". Celebrity-babies.com. Retrieved 2010-04-09. ↑ Staff writers (7 March 2008). "Hudson Heights delivers". New York Daily News. Retrieved 2008-04-08. ↑ Singh, Anita (2008-05-18). "Cannes Film Festival: Paulo Coelho's The Alchemist to be filmed by Laurence Fishburne – Telegraph". The Daily Telegraph. London.